The rapid evolution of power retail is illustrated by the Highway 400 and Highway 7 power node (Figure 5). This node grew from less than 250,000 sq. ft. of retail space in 1996 to more than 2 million sq. ft. in 2005, expanding from a single power centre to four. The scale of change is the equivalent of adding two super-regional shopping malls at the intersection. What makes this growth even more astounding is the opening in November 2004 of the Vaughan Mills Shopping Centre within a few kilometres of the same intersection, adding an additional 1.2 million square feet (with additional development potential in nearby parcels). By 2006, there was over 5 million sq. ft. of retail within a five-kilometre radius of the intersection of Highways 400 and 7. The change in retail space within the GTA between 1996 and 2006 is shown in Table 3. Of particular note is the change in the number and square footage of power centres, which increased from 24 in 1996 to 79 in 2006, representing the addition of over 19 million sq. ft. of retail space. In 1996, power centres accounted for 4.4 percent of all retail space in the GTA; by 2006 this proportion had increased to 16.5 percent. In contrast, there was little change in the major regional and super-regional centres, except for the addition of Vaughan Mills, and the renovation of several other centres. Most shopping centre growth was in the form of new suburban community and neighbourhood centre developments in the suburbs, also reflected in the growth of additional suburban retail strips. The number and size of freestanding stores also increased, largely because of the development of major grocery, pharmacy, warehouse, and discount department stores. The final column in Table 3 indicates how the share of total retail sq. ft. for each format changed between 1996 and 2006. While shopping centres retain the largest overall share, power centre square footage has increased dramatically, and the share of most other formats has declined. Tables 4 and 5 show total retail square footage and power retail square footage by municipality across the GTA between 1996 and 2006. In terms of absolute growth, the largest increases occurred in Toronto (10.6 million sq. ft.), Brampton (4.8 million sq. ft.), Vaughan (4.4 million sq. ft.) and Mississauga (4.3 million sq. ft.). Toronto accounted for one-fifth of all power retail square footage in the GTA in 2006, concentrated mainly within the suburbs (and 45 percent of the GTA's total population). However, Toronto's contribution to total retail square footage in the GTA decreased from 52 percent in 1996 to 46 percent in 2006 (Table 4). Table 6 shows the percentage change and per-capita amount of retail space, indicating strong suburban growth. 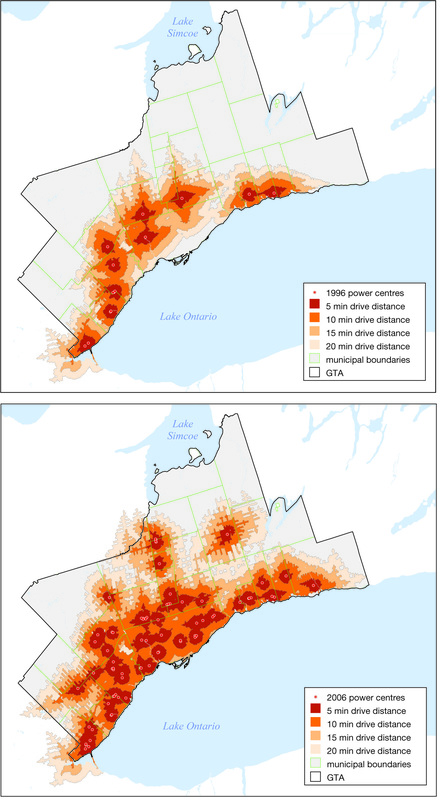 Figures 6a and 6b show the spatial distribution of power centres across the GTA according to their accessibility in terms of the number of minutes drive from residential areas. Four drive-time intervals (5, 10, 15 and 20 minutes) were generated around each power centre location. 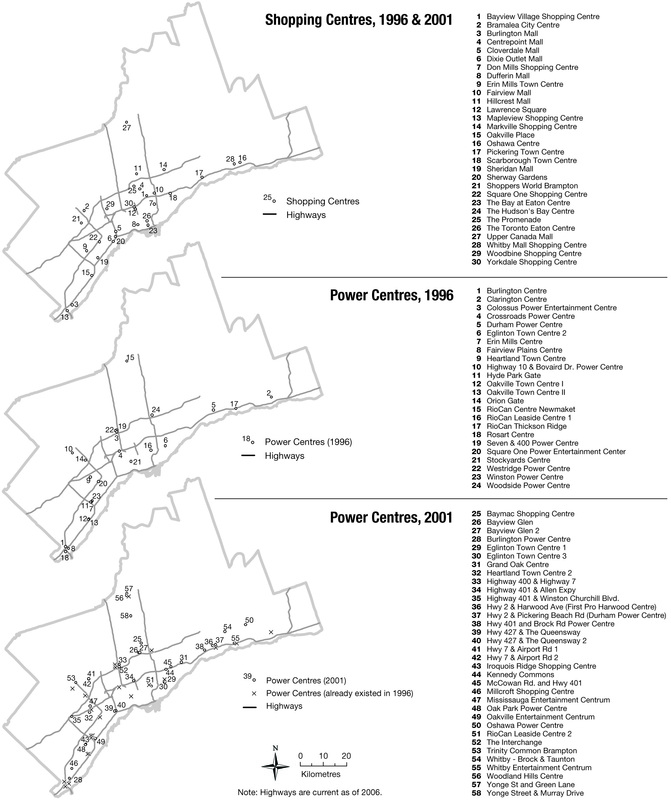 Figure 6b clearly shows the suburban expansion of power centres and the addition of new centres in the urban core. Table 7 also shows how the growth of power centres has resulted in a situation in which the vast majority of residents within the GTA now live within a short drive of a power centre. In 1996 just over 40 percent of GTA residents lived within a 10-minute drive to a power centre; by 2006 this number had increased to nearly 92 percent, and nearly 100 percent of GTA residents lived within a 20-minute drive of a power centre. Table 8 breaks the drive-time analysis down by municipality. For example, in 1996, 19 percent of Vaughan residents lived within a 5-minute drive of a power centre, by 2006 this percentage had increased to approximately 35 percent, while 83 percent lived within a 10-minute drive of a power centre, and every single resident lived within a 20-minute drive. This rapid expansion of power centres, coupled with increases in auto ownership and use and consumer demand for low prices and convenience, has given power centres a competitive advantage relative to other forms of retailing, particularly in the outer suburbs. Finally, we should acknowledge important differences between the Canadian and United States retail systems. The evidence suggests a temporal lag between the introduction and adoption of retail formats in the United States and the subsequent adoption and development of similar formats in Canada. For example, the "lifestyle" centres6 that have appeared recently in the United States (the International Council of Shopping Centres estimates that there are roughly 160 such centres in the United States) have not been widely developed in Canada. At the time of the writing, there were probably fewer than five lifestyle centres in Canada. Also, retail industry trends play out differently across Canadian and U.S. markets. For example, in Canada, the shopping centre industry has not as much abandoned the mall format as it has altered it (i.e., updated, extended, and re-branded malls) to maintain the appeal of this format to Canadian consumers. For example, despite the growth of power retailing in the GTA, the 1.2-million-sq.-ft. Vaughan Mills mall (32 km northwest of downtown Toronto) opened 15 years after the previous major mall was built in Canada. The developer, Ivanhoe Cambridge, has plans to develop at least three other similar large malls in other Canadian markets over the coming years. 5. The speed of change is also related to the fact that big-box stores are simple structures that can be built relatively quickly. In some cases, these large, warehouse-like structures are considered "interim" land uses, since they can also be demolished easily to make way for more permanent buildings or more intensive land uses. 6. A lifestyle centre is structurally and functionally different from a power centre. Lifestyle centres usually serve an upscale market, contain a mix of activities, and are designed to replicate some of the pedestrian facilities found in traditional downtowns -- that is, they tend to look like main streets or villages rather than malls or big-box centres.